This post with the easiest game day dessert ever was sponsored by Klondike as part of an Influencer Activation for Influence Central. I received complimentary products to facilitate my review. We like to entertain a lot when we can, and we often do so by having friends over for game day since we usually like to have things be pretty casual. A lot of times we have several appetizer type of dishes and by the time it comes to dessert, I don’t always feel like coming up with several mini desserts. Our friends always love when I make homemade desserts, but there are a few premade goodies that everyone loves, too. I have a rather large sweet tooth myself and love cookies, brownies, and cupcakes, but one thing my sweet tooth never seems to get tired of is ice cream. Honestly, it could be 30 below with 3 feet of snow outside and I’d still be happily eating my ice cream inside by the fire. So, I always have plenty of the easiest game day dessert ever in our freezer aka Klondike Bars. We have an extra freezer out in the garage and I pretty much have a door shelf dedicated to ice cream at all times, as you can see. I especially love having Klondike® Kandy Bars because they packaging is slim so you can fit several boxes in a small space. Which is handy because they have several decadent flavors like Mint Fudge Cookie, Caramel & Peanuts, Fudge Krunch, and Cookies & Cream available. 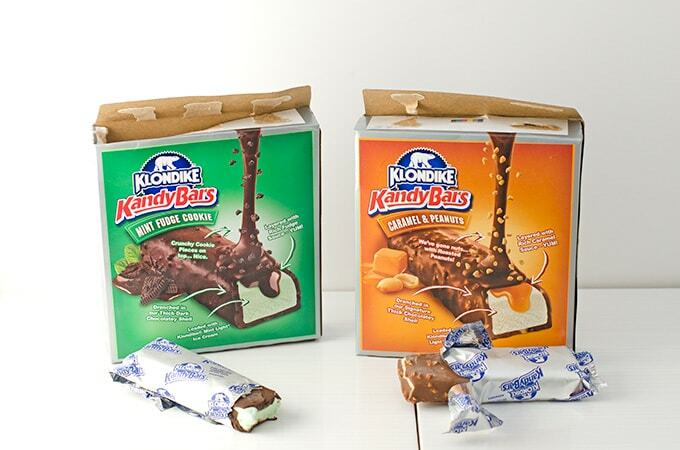 Klondike® Kandy Bars were launched back in 2014 and have the delicious combo of the thick, crunchy chocolate shell we all love from traditional Klondike bars, paired with creamy ice cream and lots of candy bar flavor. 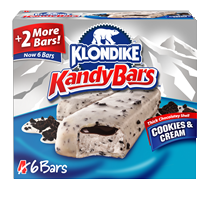 There are also 12 varieties of Klondike bars with that classic chocolate coating including Cookie Dough Swirl, Caramel Pretzel (which is a favorite of mine), Heath, REESE’S, Krunch, Neapolitan, and, of course, original. With all these varieties, there’s something for everyone to love no matter the size of your game day party. Plus, Klondike® Kandy Bars are now available in 6-count instead of just 4-count so you get even more bang for your buck. Mr. Savvy really likes the Caramel & Peanuts variety, and, while I honestly love them all, I always reach for the Mint Fudge Cookie first. 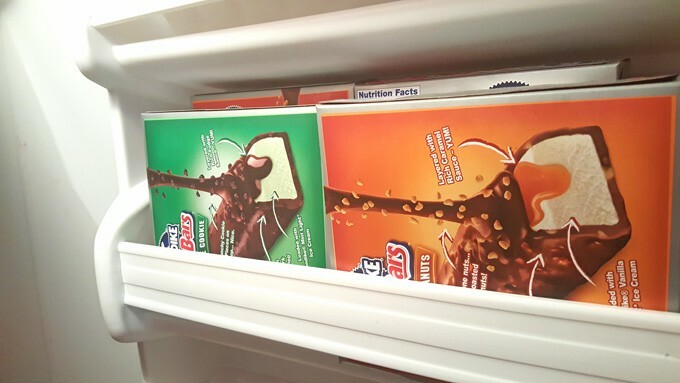 We actually have a small fridge in our den that we use for beverages, so we can easily stock it up with Klondike bars when we have friends over so they can easily pick their favorites whenever they want. Our guests love the special treat for all ages and I love that it’s a totally effortless and mess-free dessert everyone loves so I can enjoy the game, too. 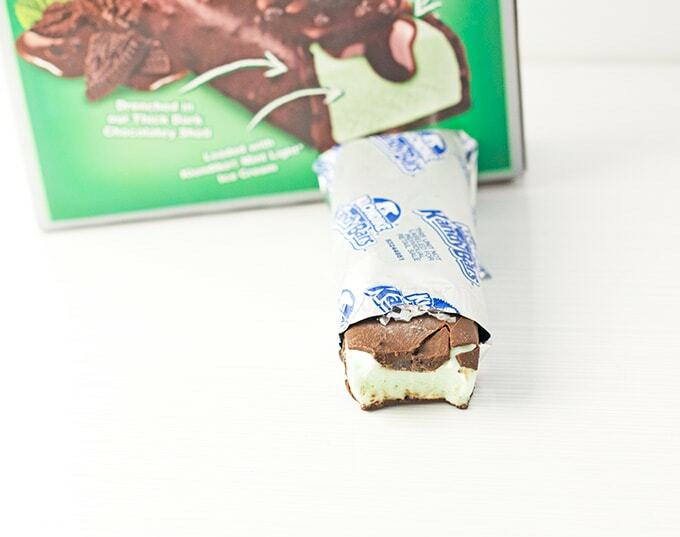 Mint ice cream with fudge cookie all covered in a chocolate coating? Yes, please! For more information about your Klondike favorites, visit KlondikeBar.com or follow Klondike on Facebook and Twitter. What’s your favorite Klondike flavor? I know it’s always hard for me to pick just one!